EOIN FINN – More Than Your Average Tree Hugger. So this isn’t very musicy – but hay, it’s where i’m at right now – i’m deep in the yoga buzz! I have a new company (more about that later) and that mean’s exciting ventures down a new path. V-Exciting! 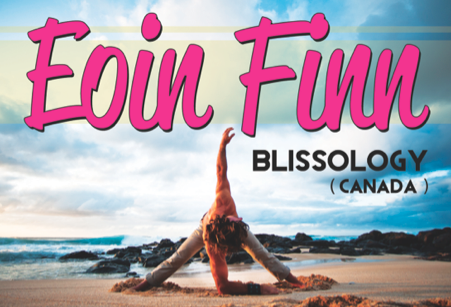 First off the rank is Eoin Finn Blissology Workshop in Piha! He’s visiting New Zealand for the first time EVER as part of the inaugural Wanderlust festival 2014. He’s a yogi legend, blissologist, ocean worshipper & surfer and will be coming to Piha Surf Life Saving Club for a super fun, one-off, transformative, happiness inducing yoga workshop, hosted by yours truly..
Piha is in for a treat. Eoin is a world-class yogi traveling the globe sharing, teaching and inspiring people with his signature Blissology Yoga classes. ‘Blissology is the art of tuning into the force that makes us feel connected to each other and the planet. Residing between Vancouver, BC, Venice, CA and Bali, he’s pumped to finally check out Piha and catch some waves while he’s at it.